All you need is 3 pipe cleaners and a piece of ribbon to make these cute Christmas tree decorations - and they should last longer than real candy canes! Take a pipe cleaner of each colour and twist them together. Cut the length in half. 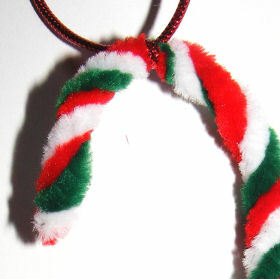 Shape each half into a candy cane. Tie a piece of cord to the top of each cane to hang it. Simple and quick! 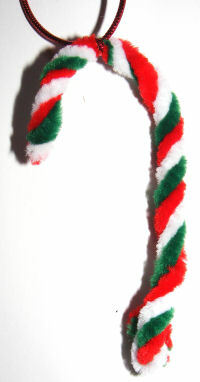 Turn two candy canes into something special to give or hang on the tree with this simple and quick Christmas craft. Perhaps the kids could make a batch to give to their special friends?